An Australian Army CH-47D Chinook helicopter has crashed in Afghanistan, resulting in the death of one passenger and injuries to five others. 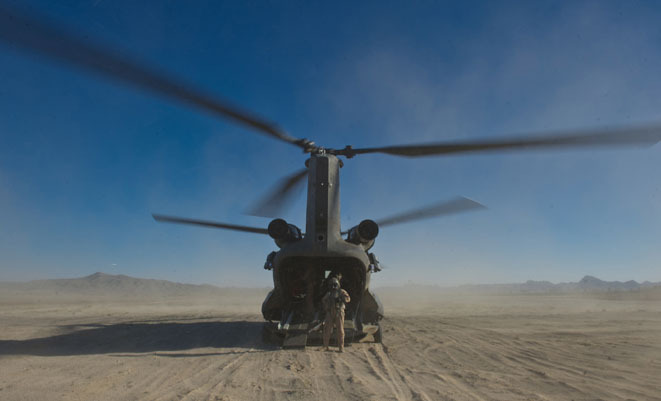 The Chinook, A15-102, from the 5th Aviation Regiment and attached to the US Army’s 159th Combat Aviation Brigade, crashed in Zabul Province on May 30. The passenger killed, 27-year-old Lieutenant Marcus Case was a qualified Army pilot deployed with the RAAF’s No 5 Flight Heron UAS detchment at Kandahar. Speaking at a joint press conference with Defence Minister Stephen Smith, Chief of Defence Force ACM Houston said a US Army Chinook helicopter was nearby at the time and witnessed the crash, and provided immediate medevac support to the downed Australian helicopter. Despite being airlifted 70kms to the ‘Role II’ medical facility in Qalat, LT Case could not be saved. The five injured Australians were evacuated to the Role III medical facility at Kandahar and have been reported as being in a satisfactory condition. The crashed Chinook was deemed unable to be recovered, and was subsequently destroyed by ISAF forces. ACM Houston added that the LT Case had served in Queensland flood relief operations earlier this year. The Army has five remaining CH-47Ds in service with two regurlarly deployed to Afghanistan during the northern spring and summer ‘fighting season’, while seven CH-47F models are on order for delivery from 2014. It is not known whether the crashed Chinook will be replaced in theatre. LT Case’s death along with the unrelated death of Lance Corporal Andrew Jones on the same day and SGT Brett Wood on May 23 brings to 26 killed and 170 wounded since Australian forces entered Afghanistan in 2001.